Take a look at the following video and tell me you can't imagine that extreme religious groups in America could ever trigger the same sectarian strife that currently plagues the Middle East. 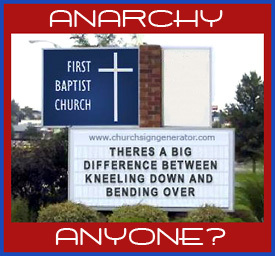 I don't think the thought is that far fetched...and I'm convinced that the evidence supports the contention that ideological intransigence has led some religious leaders in the United States to the precipice of promoting acts of anarchy. The gist of this video and many of the sermons that are being delivered in churches around the country is that the Bible is the only valid law. Further, the inference is that it is acceptable to ignore the laws of the nation when they conflict with God's law. What remains to be seen is the level of resistance that these religious zealots are willing to promote. To understand how this movement evolved, one need look no further than the last seven years of the Bush presidency. By example, George Bush has given license to those who would elect to undermine or ignore established law in favor of divine guidance. Not only did Bush argue that his actions in office were the result of consultation with a higher being, he has frequently entertained and endorsed the notion that the court system is flawed and continues to engage in inappropriate "judicial activism." Yes, he has grudgingly accepted the rulings of the courts...but not without willingly pressing the limits and challenging the conventional wisdom. These actions have established a growing sense of righteous infallibility amongst the faithful and their inclination for divinely driven defiance is palpable. My concern is how far the people his actions have enabled are willing to go should upcoming elections and rulings meet with their disapproval. I realize what I'm positing may seem far fetched, but if one listens to the rumblings that are percolating in the evangelical community...inclusive of this video and James Dobson's current assault on Barack Obama...one begins to see a pattern of rejecting the authority of the government...especially if it continues to move in directions that do not uphold doctrine. The reality of the matter is that evangelicals are still a formidable constituency that has shown a propensity to act in unison. Should that monolithic mentality be applied to the initiation of acts of anarchy, we could well witness the type of unrest that typified the Vietnam War era. The fact that the last seven years have provided evangelicals a taste of the kind of kingdom they've long envisioned only exacerbates the potential for civil disobedience...and far worse. Toss in their beliefs about the end of days and the rapture and a worst case scenario isn't that much of a stretch. In fact, I suspect there are those who would view acts of anarchy as part and parcel of a preordained plan spelled out in the Bible. While most Americans are preoccupied with the events taking place in the Middle East and the broader concept of the "war on terror", there is a growing body of evidence that suggests we need look no further than the confines of our own country to understand the dangers of ideological intransigence. Let me be clear, I'm not predicting that anarchy is inevitable. On the other hand, I am signaling a warning that we're approaching a tumultuous transitional period. Unless we're mindful of the dangers of this smoldering mind set, we're at risk of being burned by the flames of fanaticism. I'd like to take a moment to offer some emerging speculation on my part. First, let me state that I've intentionally chosen to limit my participation in the animosity that has typified the Democratic primary between Clinton and Obama supporters. In truth, I'm happy to support either candidate in November and I think that should ultimately be the position of all Democrats. Notwithstanding, the announcement by Clinton surrogates that she is interested in the vice presidency has piqued my propensity for measured cynicism. First a little background. 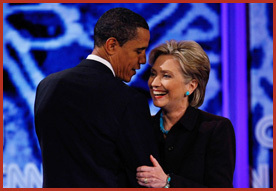 Early yesterday, the media reported that Hillary Clinton was prepared to concede the nomination to Senator Obama. In short order, Terry McAuliffe, the man cited to have made the revelation, renounced the report; stating that neither candidate had the necessary delegates to declare victory. Shortly thereafter, the Clinton campaign released an official statement reiterating that position and suggesting that no concession would be forthcoming Tuesday night. This all followed a report in which Bill Clinton spoke as if the campaign had reached its inevitable end. Then by Tuesday morning, the word from Clinton surrogates was that the New York Senator was interested in the vice presidency. Now onto my speculation. The construction and chronology of these events raised my antennae. The conflicting information simply doesn't add up and that always leads me to look for plausible alternate motivations. Let me posit a question in order to illustrate my contention. What is the purpose of leaking one's willingness to serve as vice president if one refuses to concede defeat? Isn't that the equivalent of presenting a contradiction that lacks the logic to achieve comprehension...especially when one is so ardently opposed to acknowledging defeat? 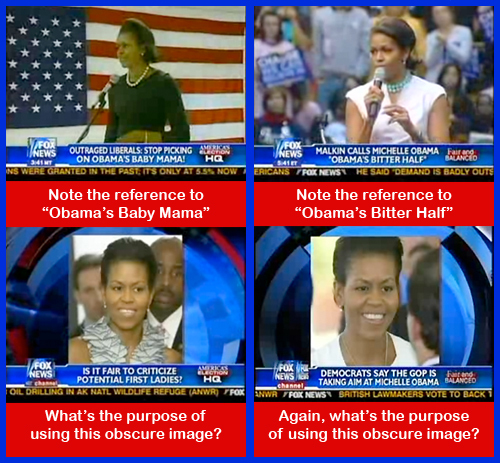 When confronted by such inconsistencies, I suspect something else is percolating in the background. As I sit here writing this posting, MSNBC is reporting that the Obama camp is looking for a negotiated arrangement which would afford Clinton the opportunity to decline the vice presidential nomination while assuring the Obama camp that she will in fact refuse the offer. Presumably, the underlying motivation is all about allowing Senator Clinton a noble and notable exit. If this latest information is correct, then it's possible the leak indicating that Clinton may be interested in the vice presidency could have been released as the means to insure that the offer would in fact be forthcoming. While that may appear logical on its surface, it seems to me that the offer and subsequent declination could have easily been negotiated in private without any preemptive public disclosures...which would have prevented it from appearing to be a contrivance. Therefore, I wonder if there is another motive that would explain this string of discordant events. Stay with me for a moment. Suppose that Senator Clinton is seeking to create a double bind for Senator Obama...one that would preclude his receiving the support of already disgruntled Clinton backers? Suppose Senator Clinton has no intention of an arrangement whereby her answer to the offer would be predetermined. Suppose having this dialogue in public is the preferred strategy...and one that would afford Senator Clinton the opportunity to assert a slight if the offer isn't made...and isn't made without preconditions. Suppose Clinton also knows that Obama has no intention of actually having Clinton as his running mate and that he would require an arrangement whereby Senator Clinton commits to declining the offer before it can or will be delivered. Hence, if she knows all of this to be true, a public dialogue could serve another purpose. In this instance, Clinton may believe she's apt to appear magnanimous while portraying Senator Obama as manipulative and willing to slight his opponent in the full view of the voting public. In other words, a publicly negotiated offer and declination would no doubt be seen as a sham. Hence, if the offer wouldn't be made without already knowing the answer, it could be viewed negatively and insure that the already reluctant Clinton supporters would refuse to back Obama in November. That would greatly hinder the likelihood Senator Obama could be elected. This could potentially leave Senator Clinton in a position to run again in four years...arguing that had she been on the ticket the outcome would likely have been different. That, coupled with all of the other arguments she has made to be the nominee, could allow her to portray herself as the rightful candidate in 2012...the candidate that she can argue should have been the Democratic choice in 2008...or at the very least on the ticket. As I stated from the outset, this is strictly an exercise in speculation. It's certainly possible that there are plausible explanations for the inconsistencies I've noted. Throughout this election, my instincts have not led me to conclude a sinister strategy on the part of Senator Clinton. Yes, it's been clear that winning is her goal and that she is an adept combatant. Then again, we've only now reached the point at which she has been backed into a corner with very limited alternatives. Fortunately, upcoming events will either confirm the unassuming and impartial perceptions I've held for many months or they will illuminate my naivete and validate the suspicions of many that Senator Clinton is simply a strident and self-serving strategist. In a nation tainted by eight years of unyielding partisanship, I would be greatly saddened by confirmation of the latter. In the interest of enabling the nation to move forward with a renewed optimism, I certainly hope the next few days will affirm the former.